It can certainly be said that the person who invented Cubism was Pablo Picasso. The breakthrough piece is quite clearly Les Demoiselles d’Avignon, which marks a sudden change in style and shows the influence of African and primitive art forms. The nudes in the painting have mask-like faces and are made up of sharp angular forms. The overall effect is one of a fractured and distorted image. In terms of who invented the actual name ‘Cubism’, this came about in 1908 when the artist Henri Matisse described Georges Braque’s ‘Houses at L’Estaque’ as being made up of little cubes. Following this the term quickly became widely adopted. As with most modern art movements, Cubism sprang from a desire to break with the past and change the meaning of art. Cubism followed on directly from the work of Paul Cezanne, who was very concerned with structure and breaking down objects into their simplest forms, as well as emphasising the multiple viewpoint of binocular vision. 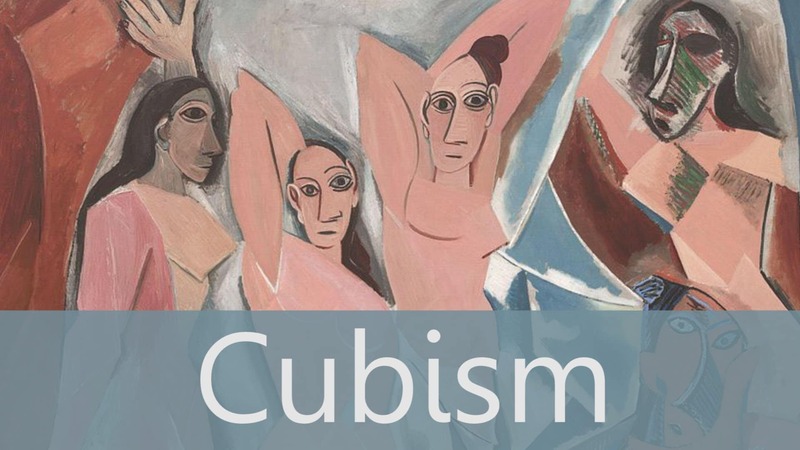 The main characteristics of Cubism were the rejection of the single viewpoint in favour of showing the fragmented subject from several different points of view, combined with the simplification of forms. The Cubist artists went much further than Cezanne, representing objects as if they were visible on all sides at the same time. Two main branches of Cubism are generally acknowledged – Analytical Cubism and the later Synthetic Cubism. Analytical Cubism was concerned with breaking down forms analytically into simplified geometric forms across the picture. They were almost like drawings in the lack of colour and monochromatic concentration on line and form. An important exhibition of work by Paul Cezanne in 1907 was a huge influence on both Pablo Picasso and Georges Braque. Analytical Cubism was a direct development from Cezanne’s approach to painting. Picasso took this approach forward and Braque gave up his Fauvist style of painting to work with Picasso on the development of Cubism. Synthetic Cubism is a later development of the Cubist Movement, and the first painting representative of this style is thought to be Pablo Picasso’s ‘Still Life With Chair Caning’ of 1912. The main characteristics of Synthetic Cubism were the use of mixed media and collage and the creation of a flatter space than with analytical cubism. Other characteristics were a greater use of colour and greater interest in decorative effects. 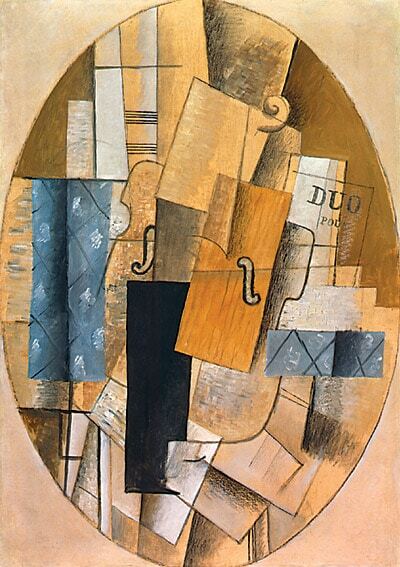 In the development of Synthetic Cubism, Picasso was the first person to use collage and text in a fine art painting. Cubist paintings included cuttings from newspapers, sheet music, pieces of cloth and painted text. 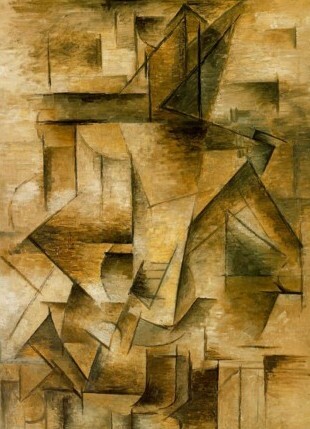 Synthetic Cubism tended to push objects together rather than pick them apart for analysis. 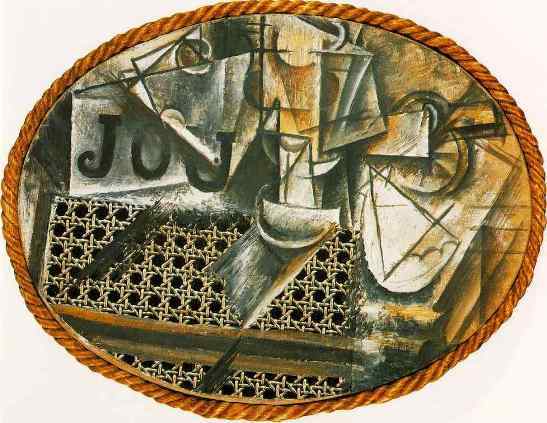 Many of the devices used were intended to flatten the picture plane and create an image with less depth than the earlier Analytical Cubist paintings.